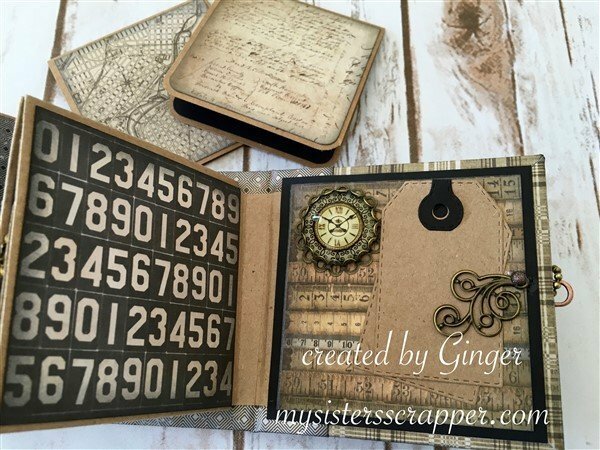 This mini measures a whopping 3-1/2″ x 3-1/2″, and Ginger used tiny 3-1/8″ square envelopes for creating the pages. You can see from the cover that Ginger had a ton of fun with ButterBeeScraps metal on this mini. 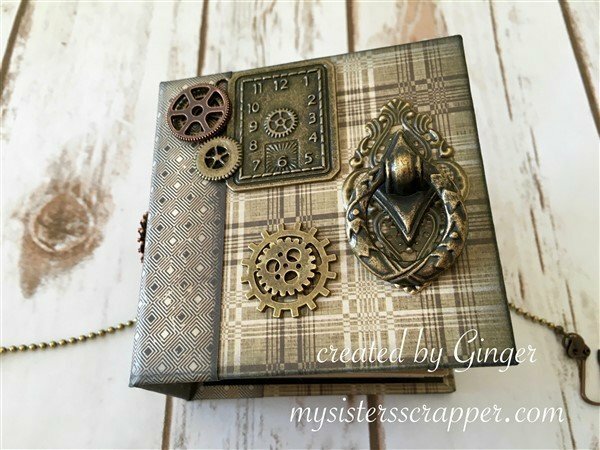 She added one of the “Creative Clocks” charms in the upper left and layered gears in a variety of sizes on top. …and how about that Antique Bronze Drawer Pull (#HD636-B)?!?! It looks like a little door knocker, and I LOVE it! She also layered a Bronze Metal Filigree Embellishment (#083-B) under the drawer pull, which frames it perfectly. 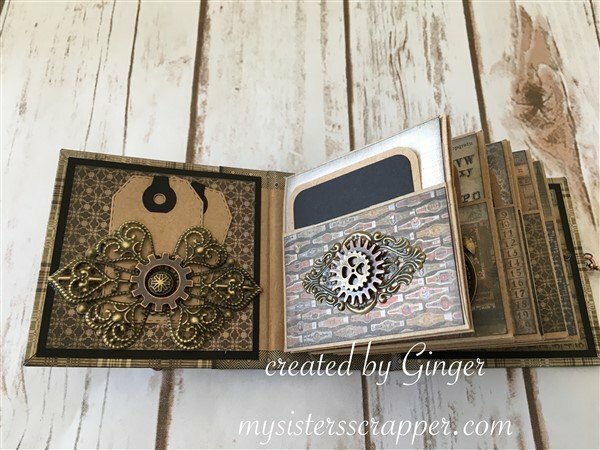 On the left, Ginger glued a Bronze Metal Filigree Embellishment (#316-B) onto the bottom of the page, and left the top unglued to tuck a couple of small tags behind it. She also layered a medium copper gear on the filigree. Moving onto the right hand page…Ginger layered another bronze filigree (#083-B) and more gears as a decorative element on the tag pocket. 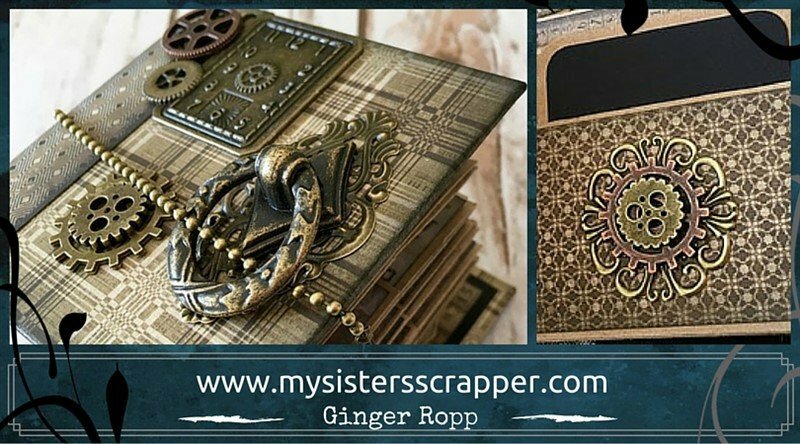 Flipping all the way to the back cover, you can see that Ginger added a Large GLASS Clock Cabochon w/ Bronze Setting to the corner of her page, and used a Bronze Metal Filigree Embellishment (#851-B) to hold more tags. As usual, I thank you for popping by today and hope you have a wonderful week! Cheers!